I showed you some test blocks awhile back, and here's the finished quilt top. I love how it turned out, but I was a little under the gun with this one, so I'm sure glad to see it finished! Happy Stitching and Happy Holidays! I'm a huge Christmas geek, and I love giving handmade gifts at the holidays . . . I just don't have much time! Here's a tutorial for a simple little holiday ornament that I created to take care of this problem. They're easy, inexpensive, and you can assembly-line them super-fast! Plus, they're sewing-themed which, well, seems appropriate. Step 1. Find a wooden spool in your treasure trove and cut the thread off. Don't feel bad - old thread is not good to sew with anyway! If you don't have any wooden spools, you can find them really easily at thrift and antique stores. Step 2. Cut or rip a long strip of fabric, about 1"-1.5" wide and 20"-40" long, depending on how large the spool is. Ripping is actually best because the frayed edges look great. Step 3. Lay one end of the fabric across the length of the spool, leaving about 6" free at the top. Step 4: Beginning at the bottom of the spool, start wrapping the fabric around the spool, wrapping over top of the fabric you laid down in the previous step. Wrap all the way from the bottom to the top of the spool, scrunching the fabric down as you go. Step 5. When you fill the whole spool, tie a double knot with the end of the fabric and the tail you left in Step 2. Cut the knot ends fairly short. Step 6. Cut a length of ribbon (about 8"). Thread both ends through the hole in the spool so there's a loop at the top, and the two raw ends coming out the bottom. Step 7. Hot glue the ribbon ends to the bottom of the spool, and cut the ribbon ends short so they don't overhang the spool edges. Be sure to use your hot glue on top of a safe work surface in case you drip. I usually just use a piece of parchment paper to protect my table. Step 8. All done! Hang them on your tree or in your sewing room for year-round decoration. Ummm, did I tell you I got to go to Quilt Market?!?!??!?! I'm still screaming silently inside my head, even though it was, like, three weeks ago. If you quilt/sew/craft, Quilt Market is just a total Geek-Out Extravaganza. I can't tell you how sweet it was to be in a gi-normous room full of quilty deliciousness, and to be surrounded by people that all think it's just as cool as you. Totally unreal. So, without further ado, I give you Part 1 of my photos from Quilt Market. I'll caption-ate them as best I can . . .
Kaffe Fassett's booth - - - and Kaffe! Dear Stella is completely delish. Look at the zigzags!!!!!!! Ahhh, my happy place. Kona solids. Michael Miller booth. With a car. Amazing. Me with my new friend April and our buddy Ty. 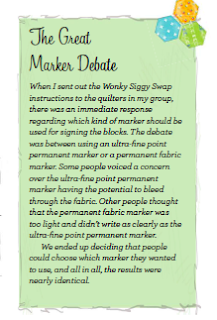 The random number generator has spoken, and we have a winner of the Sew to Swap Giveaway. Congratulations . . . JO! I'll contact you to get your shipping address - I'd love to hear about some of the amazing swaps I'm sure you're going to lead! Hi all! 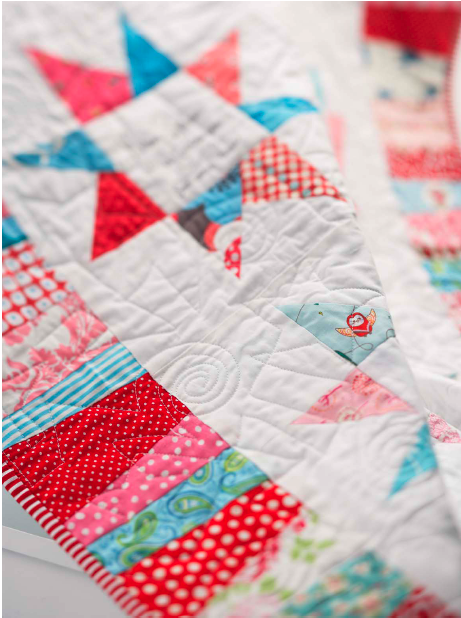 Welcome to Day 6 of the Sew to Swap Blog Hop. Hopefully you've had a chance to drop by the first 5 hop days to get some great sneak peeks of this brand new book. Keep reading below for a great giveaway prize! As I'm sure you can tell, it's gorgeous. Just pure, delicious eye candy. From the front cover to the back cover and all the pages in between, the photography by Corrie and illustrations by Ariel are just delicious. Dudes, there are twelve patterns with illustrated instructions, each one more lovely than the next. 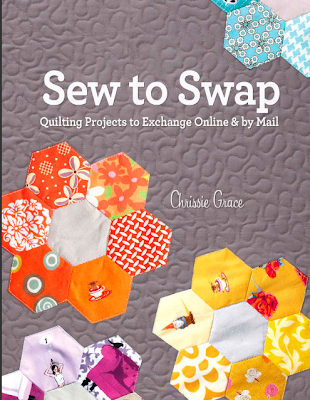 Chrissie explains how to organize ten different swaps using the patterns in the book, including everything from how many people you need to participate to specific items you'll need to send them. Super helpful. 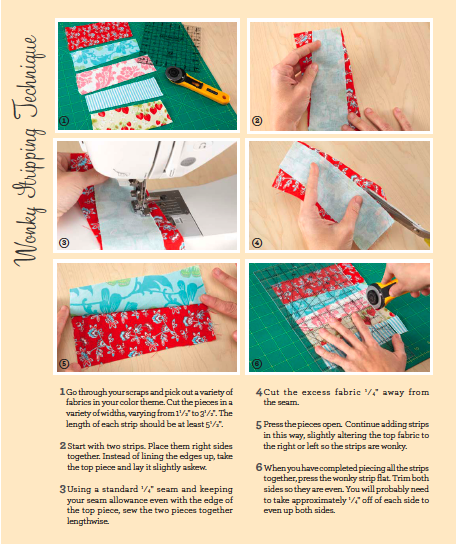 Each swap is accompanied by a photographed step-by-step technique tutorial (like the one shown below). 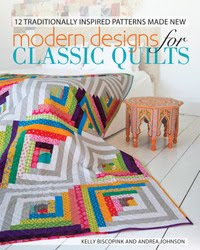 I absolutely drooled over the Wonky Siggy Quilt. 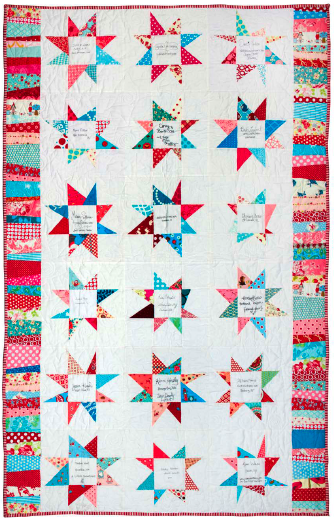 From the pink/red/aqua colors to the personalized stars to the wonky border, I couldn't love this quilt any more. One of the questions that came up while we were working on these blocks was what kind of marker to use to autograph the centers of our blocks. The results of that conversation between the swappers was put in the book as "The Great Marker Debate." Even though the resolution is that there is no resolution, it's good to have the discussion, right? Special for those of you who are joining in the blog hop fun, you can get Sew to Swap now for just $14.99 ($10 off the retail price!). Visit the Martha Pullen Online Store and use promo code SEW2SWAP to get your exclusive discount. The Blog Hope continues tomorrow and for several more days. Be sure to hop along! I hope you all enjoy the book, and happy swapping! I think I love it . . . but then again, I might be crazy . . .
Ok, I'm just the teensiest bit obsessed with pumpkin these days. They smell like the holidays. You can roast their seeds. You can carve faces into their shells. You can make them sweet or savory. You can add them to lattes with fantastic results. Babies look cute when seated next to them. Again, they taste like happy. I'll admit, I lurve pie, but it's not super portable. But cupcakes are . . . so why not combine the best of both worlds? 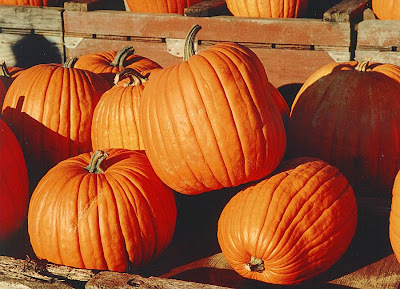 Cupcakes with frosting and pumpkin pie? Ummm. . . yes please, I will. I cheated a bit, though. I didn't make "from-scratch" frosting, which normally I would, but I just ran out of time. I didn't want to use plain' ole frosting from a can (and I have a slight aversion to cream cheese), so I mixed cinnamon into a can of vanilla frosting, and it tasted great. 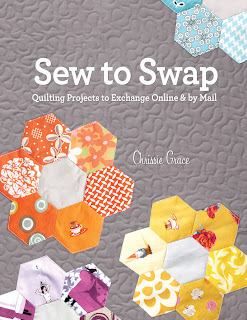 SO I had the incredible privilege of being asked to contribute to a book that has just hit shelves: Sew to Swap by Chrissie Grace. And woah boy, am I in some good company: The contributors to this book are insanely talented, and I feel very small and squeaky to be standing next to all of them!!! To tell you more about the book and to kick off its release in grand style, a blog hop is starting tomorrow (November 7) which will bounce you each day between the book contributors' blogs. I don't know what everyone has planned, but I suspect there will be some exciting giveaways, as well as lots of great info about this book. I can tell you for sure that there will be at least one awesome giveaway here on my day. So, plan on Hopping, y'all! I've been remiss in my posts, but things have been a bit crazy and hectic as I'm sure many of you can understand. I've not abandoned you, though! In the most exciting news, I was able to attend Fall Quilt Market this past weekend in Houston. Ummm . . . amazing!!!!!! There's so much to say that I'm speechless. I'll write a nice, long, juicy post soon with lots 'o pix, etc., but for now, let's suffice it to say that being in a room full of like-minded people who all love the same thing was an amazing, inspirational experience. Thank you to everyone I had the opportunity to meet for the wonderful conversations and for sharing your excitement and passion with me. 1. There is a very cool blog tour coming up shortly in November. I'll be a stop one day on the tour, and there will be great giveaways, etc. on all days. Be sure to stop back frequently to check for updates! For now, I'm not giving away the surprise - - - just check back soon for more details! 2. I want to get more structured with my blogging, and I have SO many ideas of what that might entail, but I want to ask y'all what you would like to see more of - both from me specifically and from the sewing blog world in general. More techniques? More tutorials? Book reviews? Interviews? Fabric recaps? Quilt-a-longs? Gimme ideas puh-lease! Thanks for stickin' with me, folks. There's a lot out there in the blogosphere, I know, but I love being part of it! BABY SHOWER! I threw one recently for one of my best friends, but there's a bit of a catch . . . she had the baby already! Due mostly to poor planning on my part, I scheduled a surprise baby shower for the day after my bestie went into labor. I decided that she probably wouldn't be super-keen on leaving the hospital early to eat cupcakes at my apartment, so I rescheduled for a few weeks down the road. BUT, her friends and family and I prevailed and we celebrated a few weeks late - no biggie! I totally loved this diaper cake (could not find white diapers anywhere), but I think I startled my friends and family when they would walk in and see boxes of diapers around my apartment. . . The favors for the guests were these super-cute little herb planters. And I made 'em myself! And due to the fact that the party was delayed 6 weeks, they had really grown a lot! No tutorial needed on this: Spray paint terra cotta pots with that blackboard paint. Plant your herbs. Write the name of the herb on the pot with chalk. Wait six weeks. Tie a bow around the pot, and tie on a little piece of chalk. Give 'em away! Ummm. . . I love him!!!!!!! ARGH, so cute!!!!! !